A study earlier this year confirmed there's methane in the air of Mars. Methane is typically produced by living things, so the finding prompted hope there could be organisms on Mars. The tantalizing evidence for Martian methane goes back several years, in a seesaw scenario of optimism and skepticism. 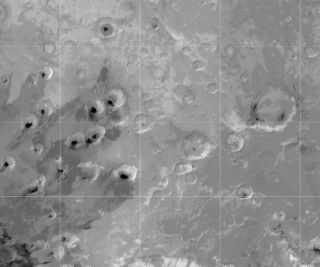 Plumes of methane in the martian air have been confirmed, but its origin has remained highly debated. But a new study, detailed in the journal Nature today, finds the methane is concentrated in one spot. If it were generated by life at or under the surface, the methane should be spread throughout the atmosphere, the researchers argue. Its concentration suggests it is generated by some sort of chemical reaction in the atmosphere. "Destruction of methane on the surface of Mars would have to occur within about one hour to explain the recent observations," according to a summary by the journal Nature. "If observations of spatial and temporal variations of methane are confirmed, this would suggest an extraordinarily harsh environment for the survival of organics on the planet," write the researchers, Franck Lefevre and Francois Forget of the Universitaire Pierre et Marie Curie in Paris. "Something is rapidly destroying the methane in the Martian atmosphere," planetary scientist Michael Mischna of NASA's Jet Propulsion Laboratory says in ScienceNow. Whatever that might be, Mischna said, "there's no way life could survive at or near the surface if [methane] destruction occurred so quickly."